The oven-fried chicken in Carb Wars; Sugar is the New Fat, always brought raves. 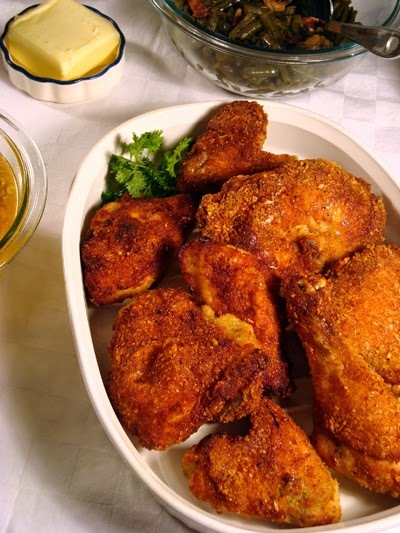 People told me it was the best fried chicken they had ever eaten; juicy and tender on the inside with a crisp, brown crust that stayed on the chicken, not in the skillet. The addition of a little Parmesan makes this version from Nourished even better! Flour or bread crumbs can’t produce a crisp, brown crust that compares to this. Have ready a rack (for drying) and a large roasting pan. You may need a second pan to avoid crowding the chicken. For more uniform-sized pieces, cut each breast half crosswise into 2 pieces or have butcher cut it. Rinse chicken pieces and blot dry. Trim away any extra skin and fat. Sprinkle with salt and pepper and set aside. Process pork rinds in the bowl of a food processor until finely ground. Place pork rind crumbs on a dish; you will need about 1½ cups of processed crumbs. Stir in Parmesan. In a medium bowl, whisk egg whites until foamy. Whisk in the cream. Dip chicken in egg white and cream mixture and then roll in pork-rind mixture until evenly coated. Place on a rack to dry for 15 minutes. Preheat oven to 425º F. Place the fat or oil and the butter in the roasting pan. Put the pan in the preheated oven until butter is melted, about 5 minutes. Place chicken in the pan, skin side down, and bake for 30 minutes. Turn the chicken and bake for an additional 30 minutes, or until well-browned and crisp. Serve hot or cold. Servings: 5 servings of 2 pieces each. * You can omit the butter and use a total of 1/2 cup of any oil or fat. About ½ cup of the cream and egg white mixture and ½ cup of the pork rind and Parmesan mixture will be left over, so the carb count will actually be close to zero. Most of the fat will also stay in the pan, so the actual fat and calories will also be lower. Recipe from Nourished; a Cookbook for Health, Weight Loss, and Metabolic Balance. Disclaimer: I will receive a commission from sales of the book mentioned above. Best Fried Chciken Ever, Parmesan Cheese, Pork Rinds. Bookmark. This was soooo good! Found this recipe on Pinterest and I am grateful! Husband loved it and he is not doing Low Carb! Hi Traci. I'm so glad the chicken was a hit! Can I do this with boneless/skinless chicken breasts too? Anonymous: Certainly you can do it with boneless chicken or other cutlets as well. (It may get done sooner.) However, meats cooked on the bone are more nutritious (and who doesn't love to gnaw a drumstick?). Sounds like an awesome recipe! Do you have a recommendation for non pork eaters ( no rinds)? ques re: the oil – you choose one of the four, right? "¼ cup peanut oil, light olive oil, lard, or bacon fat." Directions say place oil AND fat in roasting pan, but is it both or one or the other? Also, do you know if this will work just as well on a cookie sheet? Thanks for pointing out the confusion, Kerri. I try to clarify the recipe. There is a total of 1/2 cup fat, 1/4 cup of which can be a high heat oil or a stable fat like lard or tallow, or even bacon fat. I specified only 1/4 cup butter, because if you use all butter, it might burn. Actually you can use any fat or combination of fats that can take the heat. It all goes in the pan together. Kerri, I forgot the second part of your question. No, don't use a sheet pan. More fat will come out of the chicken so it will have more than the original 1/2 cup and the pan will overflow. Made this tonight, it was insanely good. Better than breaded chicken! Thanks so much for sharing! Thanks, Christina Daly! I'm so glad you liked the recipe. It's a real favorite around here. People tell me, "this is the best chicken I ever ate," and they don't even know it is low-carb! OMG!! Made this tonight and my husband and I both loved it. It got kinda smoky from the high heat and oil but we didn't care. Just opened some windows and turned on the fans. It's a keeper. Hi Linda. I'm glad you liked the chicken! As to the smoke, what kind of oil and/or fat did you use? I use a fat that can take high heat to help offset the low smoke point of the butter, but it needs to be one like light olive oil, not extra virgin olive oil or coconut oil, which smoke at about 350 degrees. A non-trans fat shortening would work too or avocado oil or some brands of peanut oil (check the label for the smoke point.) If the oil is not a problem, perhaps your oven temp is on the high side? Clarified butter can take high heat if you want to try that. Oops, I did use extra virgin olive oil. I didn't know there was such a thing as high heat oil but next time I will be sure to find some. I appreciate your letting me know about it. Linda: yes, oils and fats vary a lot in how much heat they can take. It's better to avoid burned oil as much as possible. EVOO has healthful properties that the more refined one doesn't, but it is too fragile to take much heat. It should be kept in a dark bottle in the refrigerator and only used cold or for very quick stir-frying. IvO: Thanks for the comment. Glad you enjoyed your lunch! Made this last night with boneless chicken breasts (4). Added a little Chipotle chili powder to the pork rind breading as we like a little spice. Used my Mauvial steel fry pan and it worked like a charm. Loved the crunch. Had leftovers tonight that I heated up in convection oven for 12 minutes which retains most of.the crunch -served over Caesar salad. Cooked chicken for 20 minutes, turned and another 20. Will reduce time next time as a little too done for me. Thanks for the comment and for sharing! I just wanted to verify: no oil needs to be put on the top part of the chicken while the bottom Cooks first?